Once upon a time, before computers, Internet, email, and texting, there was something known as the “letter.” This ancient form of communication provided people who did not live near one another the opportunity to share news and feelings. When I was a child <cough, cough> a hundred years ago, I had a pen pal. We sent letters back and forth, each trying to outdo the other with our creativity. Now those letters and postage stamps have been replaced with OMG! ROFL! TTYL! and unlimited data plans for all household members with opposable thumbs. More than six years after becoming law, the Affordable Care Act (ACA) remains heavily litigated. 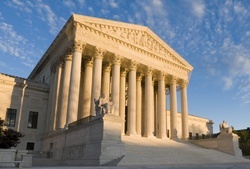 Since 2010, dozens of lawsuits have been lodged against it, with four of them reaching the United States Supreme Court – a remarkable number given the law’s relatively short lifespan and the fact that the Court only grants approximately 80 of the 8,000 case petitions it receives each year. ACA litigation continued apace over the past year, with two new important decisions handed down in May of 2016. This is the second installment of a 2-part commentary by Jones & Bartlett Learning author and health policy expert, Joel Teitelbaum, on the most recent challenge to the Affordable Care Act (ACA) before the U.S. Supreme Court. This is the first installment of a 2-part commentary by Jones & Bartlett Learning author and health policy expert, Joel Teitelbaum, on the most recent challenge to the Affordable Care Act (ACA), now a case before the U.S. Supreme Court. The second installment will discuss the Supreme Court’s decision in the case (expected by the end of June, when the Court concludes its current term). Below is the preface for the highly anticipated Second Edition of Essentials of Health Policy and Law, by Joel B. Teitelbaum, JD, LLM and Sara E. Wilensky, JD, PhD from School of Public Health and Health Services, George Washington University. 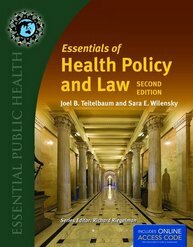 Essentials of Health Policy and Law, Second Edition will be publishing April 1, 2012. Visit us to request your complimentary review copy today. Health policy and law are matters of national and local focus and concern. Public opinion polls, media coverage, and policy debates at all levels of government and in private industry attest to the important place that health care and public health hold in the minds of the American public, policymakers, and lawmakers. The constant attention showered on health policy-related topics also highlights their complexity, which stems from multiple factors. First, like most challenging public policy problems, pressing health policy questions simultaneously implicate politics, law, ethics, and social mores, all of which come with their own set of competing interests and advocates. Second, health policy debates often involve deeply personal matters pertaining to one’s quality—or very definition—of life, philosophical questions about whether health care should be a market commodity or a social good, or profound questions about how to appropriately balance population welfare with closely guarded individual freedoms and liberties. Third, it is often not abundantly clear how to begin tackling a particular health policy problem. For example, is it one best handled by the medical care system, the public health system, or both? Which level of government—federal or state—has the authority or ability to take action? Should the problem be handled legislatively or through regulatory channels? The final ingredient that makes health policy problems such a complex stew is the rapid developments often experienced in the areas of health care research, medical technology, and public health threats. Generally speaking, this kind of rapid evolution is a confounding problem for the usually slow-moving American policy- and lawmaking machinery. Broadly defined, the goal of health policy is to promote and protect the health of individuals and of populations bound by common circumstances. Because the legal system provides the formal structure through which public policy—including health policy—is debated, effectuated, and interpreted, law is an indispensable component of the study of health policy. Indeed, law is inherent to the expression of public policy: major changes to policies often demand the creation, amendment, or rescission of laws. As such, students studying policy must learn about the law, legal process, and legal concepts. The range of topics fairly included under the banner of “health policy and law” is breathtaking. For example, what effect is health care spending having on national and state economies? How should finite financial resources be allocated between health care and public health? How can we ensure that the trust funds established to account for Medicare’s income and disbursements remain solvent in the future as an enormous group of Baby Boomers becomes eligible for program benefits? What kind of return (in terms of quality of individual care and the overall health of the population) should we expect from the staggering amount of money we collectively spend on health? Should individuals have a legal entitlement to health insurance? How best to attack extant health disparities based on race, ethnicity, and socioeconomic status? What policies will best protect the privacy of personal health information in an increasingly electronic medical system? Can advanced information technology systems improve the quality of individual and population health? Should the right to have an abortion continue to be protected under the federal Constitution? Should physician assistance in dying be promoted as a laudable social value? Will mapping the human genome lead to discrimination based on underlying health status? How prepared is the country for natural and man-made catastrophes, like pandemic influenza or bioterrorism attacks? What effect will chronic diseases, such as diabetes and obesity-related conditions, have on health care delivery and financing? How best to harness advancing scientific findings for the benefit of the public’s health?